Depending on your perspective, this admonishment the wise King Solomon penned thousands of years ago can have two meanings: We’re to be mindful of our thoughts because they lead to the good and bad choices we make in life, or we’re to take special care of our hearts through healthful eating and regular physical activity because a healthy heart sustains life. A diseased heart will not. This is a sobering message many of you will be sharing with clients and patients more so this month as you acknowledge American Heart Month. Heart disease is the leading cause of death among men and women in this country, but it doesn’t have to be because it’s preventable. 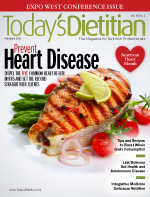 In our cover story, “Prevent Heart Disease,” nutrition professionals discuss the top five misconceptions clients often have about cardiovascular health that may be preventing them from living their healthiest lives. RDs dispel these myths and set the record straight by giving you the facts to share with clients and patients. Clients will learn that not everyone experiences the same heart attack symptoms, and just because heart disease runs in their family doesn’t mean they’re destined to get it. The article provides strategies you can use to effectively communicate the truth about heart disease to clients so they’ll leave your office armed with accurate information. In “Sudden Cardiac Death and Young Athletes” (Focus on Fitness), Jennifer Van Pelt, MA, discusses the increased prevalence of this tragic event among high school and college students, risk factors, and ways dietitians can help prevent it. Screening these young athletes for heart abnormalities before playing rigorous sports has become a controversial topic of late, as some in the medical community are in favor of using more sophisticated diagnostic methods while others are not. Since dark chocolate has been shown to improve heart health, Bryan Roof, RD, LDN, provides a delicious recipe for chocolate truffles in his Culinary Corner column. Just remember to tell clients that one small piece of dark chocolate, not 10, a few times a week benefits the heart.